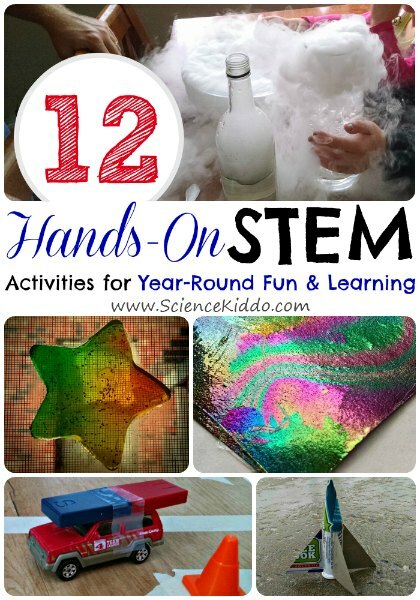 This round up of the most popular hands on science activities from The Science Kiddo includes 12 hands on science activities for kids to do year-round! Parents often tell me that they want to do hands on science activities with their kids, but they don’t know where to start. They feel overwhelmed or they are worried the activities will be too complicated. 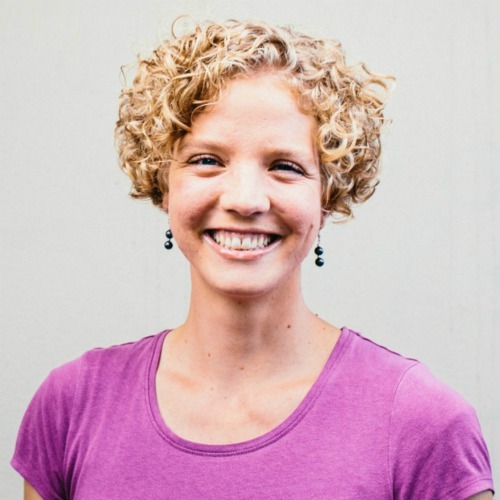 To help you start the New Year on the right foot, I have gathered the 12 most popular posts from 2015 on The Science Kiddo. This gives you one easy hands on science activity to do per month with the kids this coming year. 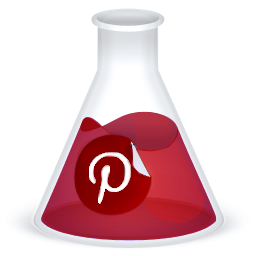 Save this article on Pinterest so you can refer to it often this year! 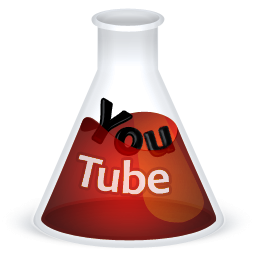 This is a list of the best of the best, the easiest and the most fun hands on science activities out there. I hope you enjoy them as much as we have! January: Fishing for Ice – If you live in a snowy place you have probably noticed how snow plows drop salt onto the roads after a snowstorm or how people sprinkle rock salt on their icy steps. Why do they use salt? What does it do? 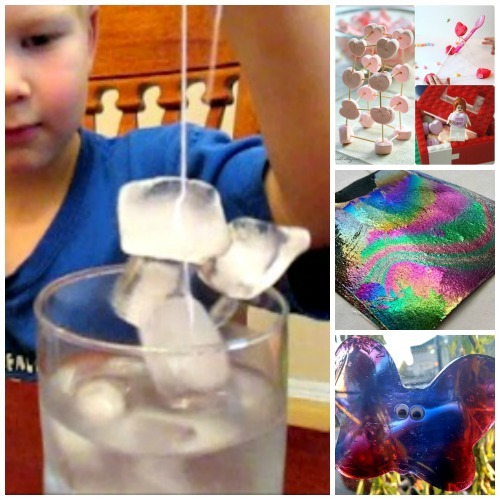 Find out the science behind how how salt melts ice and go “fishing” to see if you can use this science to “catch” some ice cubes of your own! February: 20 Must-Try STEM Activities for Valentine’s Day – With Valentine’s Day right around the corner get prepared with some heart-themed science, engineering, and math activities to do with the kids! Make Valentine’s cards with their own electrical circuit, experiment with heart-shaped candy, and make cupids fly using a balloon! March: Rainbow Paper – This was by far our #1 post for the year! It was even featured in this BuzzFeed article along with 34 other “magical” science activities. Making rainbow paper is super easy and turns out dazzling results. Give it a try for St. Patrick’s Day this year and see if you can finally discover the leprechaun’s hidden pot of gold! April: DIY Squishy Window Gel Clings – Celebrate the return of the spring sunshine by making your own squishy window gel clings. They are bright, colorful, and made with nontoxic ingredients. 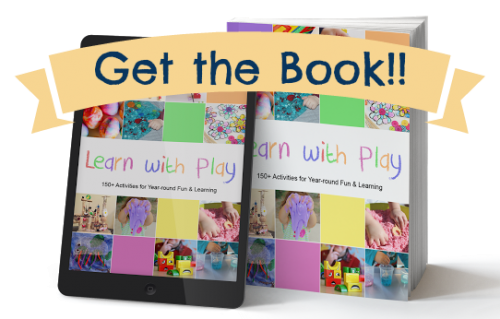 This article is also included in the more than 150 hands-on learning activities found in the new book, Learn With Play! May: Magnet Powered Car – Pull out your magnet set and your toy cars and get playing! 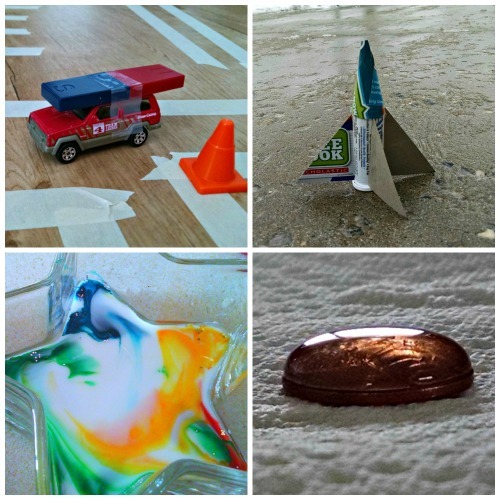 This is still one of our favorite science activities to do together as a family. Try out different magnets to see which one drives the car the best, try to keep your car in it’s own lane, and smash into each others’ cars, all with magnets. June: Film Canister Rocket – What better way to get a child interested in science than to shoot off a rocket? This explosive demonstration teaches kids about chemical reactions in a way that they won’t forget! 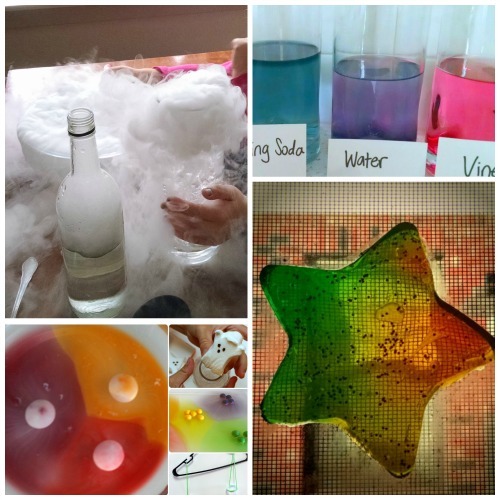 July: Magic Milk – Create art and learn science at the same time! Celebrate Independence Day by creating magic milk that looks like fireworks in the sky. 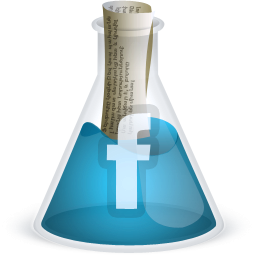 September: Make Your Own pH Indicator – Use a surprising kitchen ingredient to test the acidity of different solutions. We love this chemical reaction because it produces such beautiful colors! 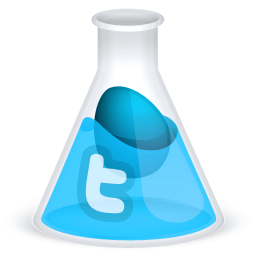 October: Dry Ice and Water Play – Get in the Halloween spirit by mixing up some frothy potions and brews. This article contains at least 7 ways to play with dry ice and water that are sure to be a hit at your next Halloween party! November: Candy Math and Science – Once you are in post-Halloween candy overload check out this article! You will find over 25 ways to do math, science, and engineering activities with all of those goodies. Trust me, your waistline will thank you. December: Christmas Window Gel Clings – Decorate for the holidays with these glittery Christmas-themed window gel clings. Customize the shape, color, and sparkle using 100% nontoxic ingredients. The squishy leftovers make for some fun winter sensory play, too! Oh what fun! We love science activities! Sharing! 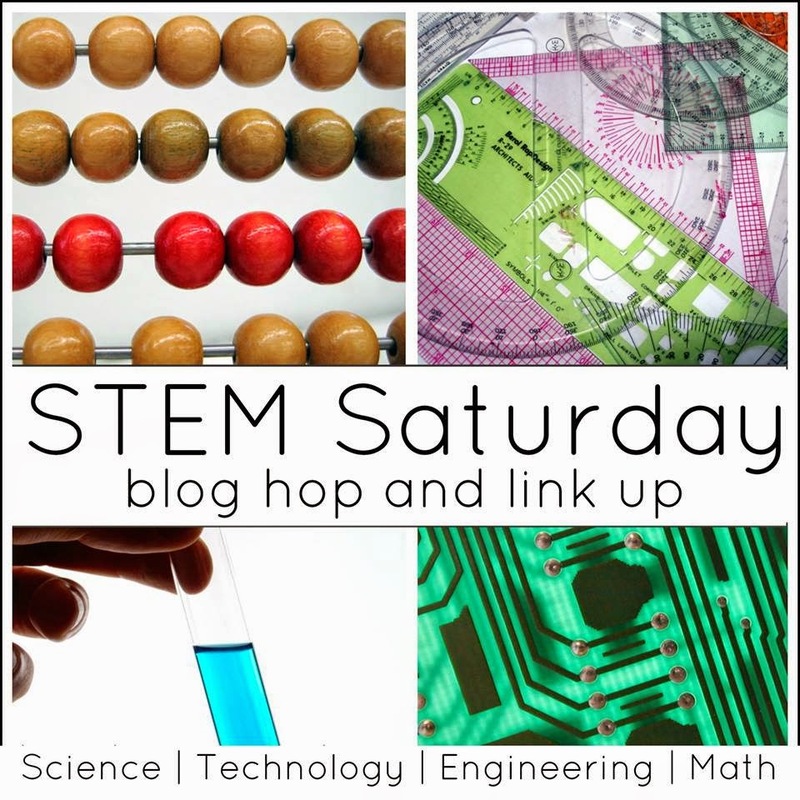 So many amazing science activities in one place. Shall be pinning so I can return again throughout the year.